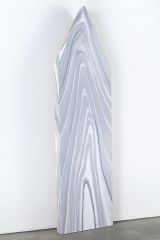 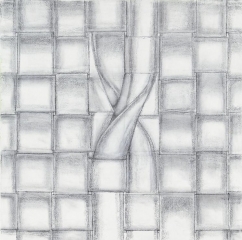 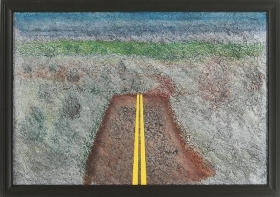 David Nolan Gallery is proud to announce an exhibition of “Weave” works and landscapes by Richard Artschwager (American, b. 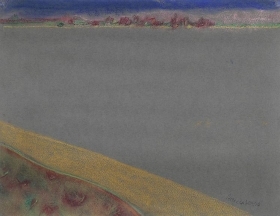 1923). 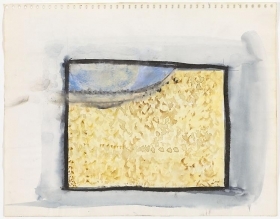 This will be the artist’s sixth exhibition with the gallery. 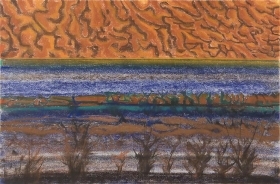 The show opens on October 27th and will run through December 3, 2011. 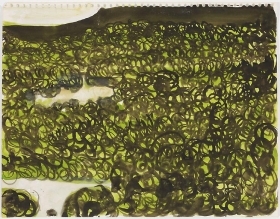 Richard Artschwager is undoubtedly one of the most important artists to emerge in America during the modern postwar era. 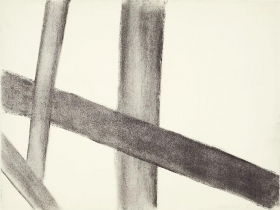 His enigmatic works defy easy categorization and have influenced generations of younger artists through his ability to show us the symbolic power of ordinary things. 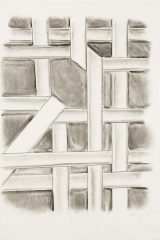 He arrived in New York in the late 1940’s after serving in World War II and studied with the French Cubist painter, Amédée Ozenfant. 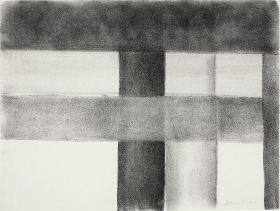 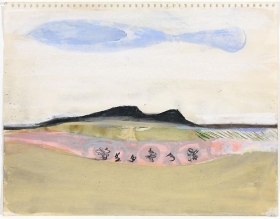 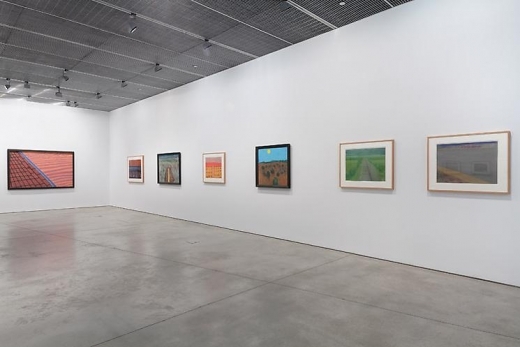 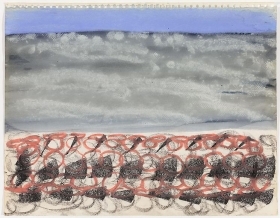 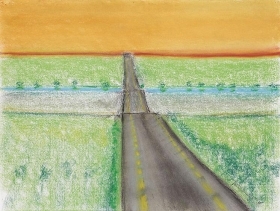 A fledgling art critic named Donald Judd saw Artschwager’s paintings and drawings of landscapes in a gallery on Madison Avenue in 1959 and several years later, Artschwager exhibited at the famed Leo Castelli Gallery where he showed alongside Jasper Johns, Robert Rauschenberg, and Claes Oldenburg. 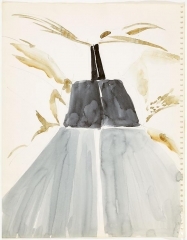 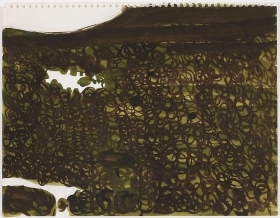 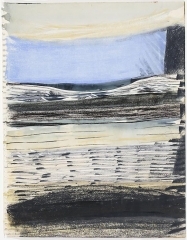 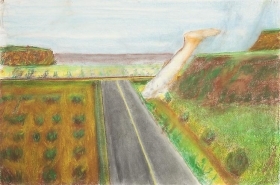 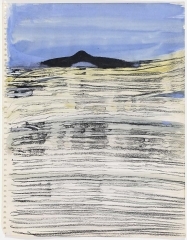 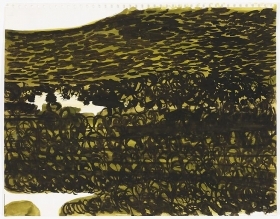 Artschwager’s landscape drawings will be a focus of the exhibition. 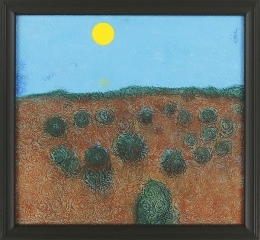 Artschwager’s family moved to Las Cruces, New Mexico when he was a child because of his father’s poor health, and the desert landscape made a lasting impression. 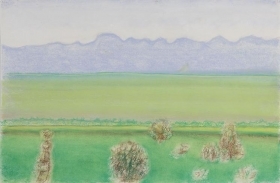 Noted throughout his career for his cool detachment and gray palette, these landscapes represent the most subjective of the artist’s oeuvre, rendered in brilliant colors. 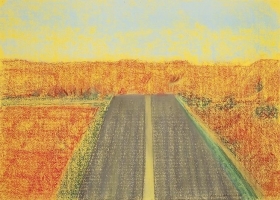 Artschwager returned many times to New Mexico as an adult, still captivated by the endless roads, craggy terrain, and desert shrubs, and portrays the scenery from many different perspectives in drawing and painting. 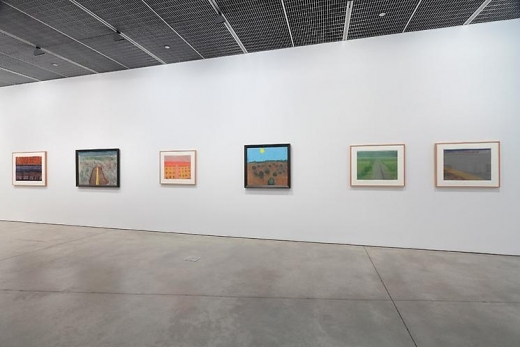 Over the years, the vernacular of the New Mexican landscape became as important to his work as southern California was for Ed Ruscha, another member of Castelli’s stable of artists. 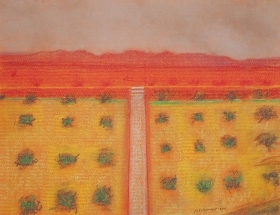 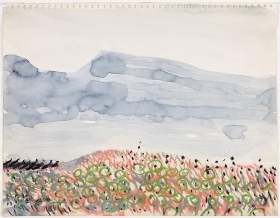 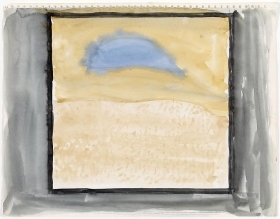 This exhibition will feature watercolor landscapes from Artschwager’s early sketchbooks and work from the last decade. 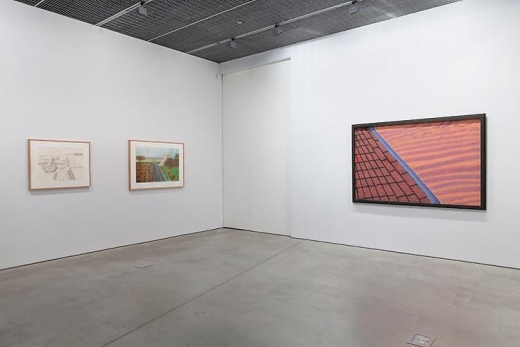 A master of illusion, Artschwager conceived sculptures as hybrids of familiar everyday objects, such as tables, chairs, and cabinets. 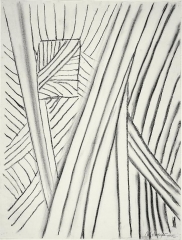 These objects were often made of ignoble materials chosen for their mimetic effect. 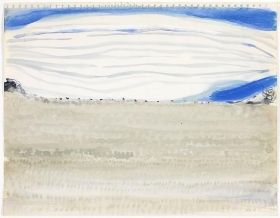 Like Franz Kline and Joan Miró did before him, he painted on Celotex, a material used for ceilings whose rough surface and whorled patterns evoke the impression of clouds and softened Artschwager’s drawn and painted lines. 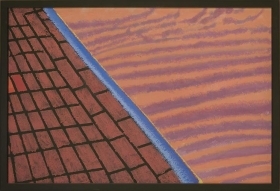 He conceived sculptures made of Formica because it had the functionality of wood and is an image of wood at the same time. 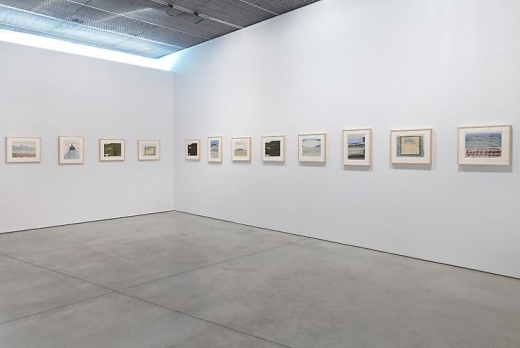 Artschwager exploits the slippage between fine art and functional design: "I'm making objects for nonuse. 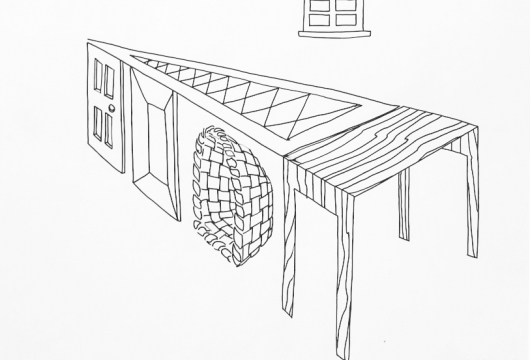 By killing off the use part, nonuse aspects are allowed living space, breathing space." 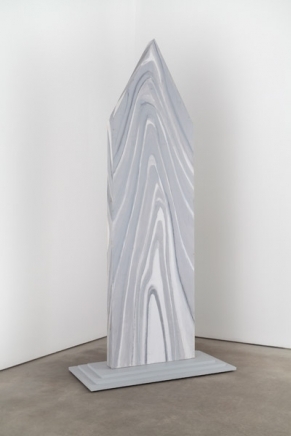 On view in this exhibition will be a major wooden sculpture called “Arch” (2007), whose title alludes to architecture, but its surface, painted in strokes simulating wood grain, call painting to mind. 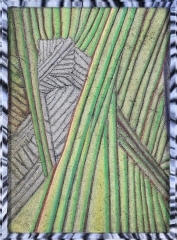 “Weave” will be another major theme of this exhibition. 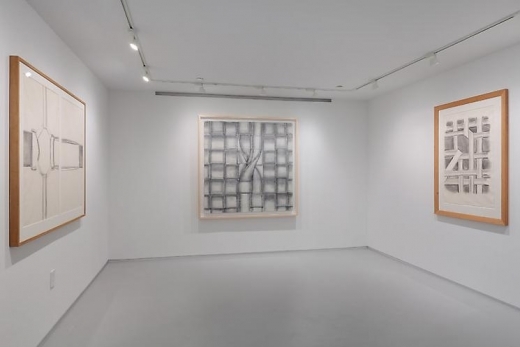 The interlacing of textile and wood fibers to create canvas and paper has been an ongoing interest of Artschwager, who has drawn and painted weave-like patterns to create what he calls “objects as images of objects,” art works that present themselves simultaneously as fact and as image. 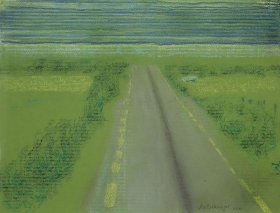 Fond of an ivory laid Strathmore, he is attentive to the reticulated surface as he draws with charcoal, pencil, and pastel, similar to the way that Georges Seurat preferred the ribbed texture of the handmade paper he used for his Conté crayon drawings. 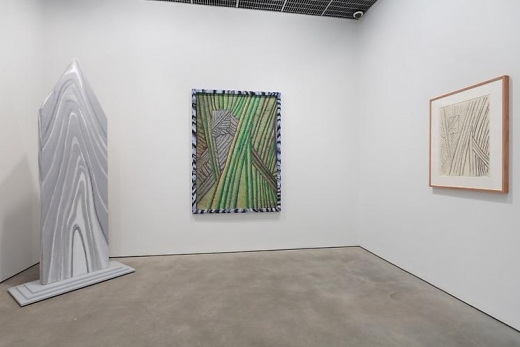 Recently, Artschwager has been painting and drawing on paper handmade from crushed sugar cane pulp, whose coarse texture is a persistent reminder to the viewer of the work’s status as an object.